It’s moving day for my tomato seedlings — their first moving day, actually. My seedlings move a total of 3 times after they emerge, first into 3 inch pots then, into 5 inch pots and finally, into the garden. This year I am growing four different varieties but two of my favorites – Atomic Grape and Fox Cherry are indeterminate so they need to be transplanted before the other two varieties. Starting my seeds in the grow trays has advantages. I can get the soil warm, quickly and I can keep it consistently moist. 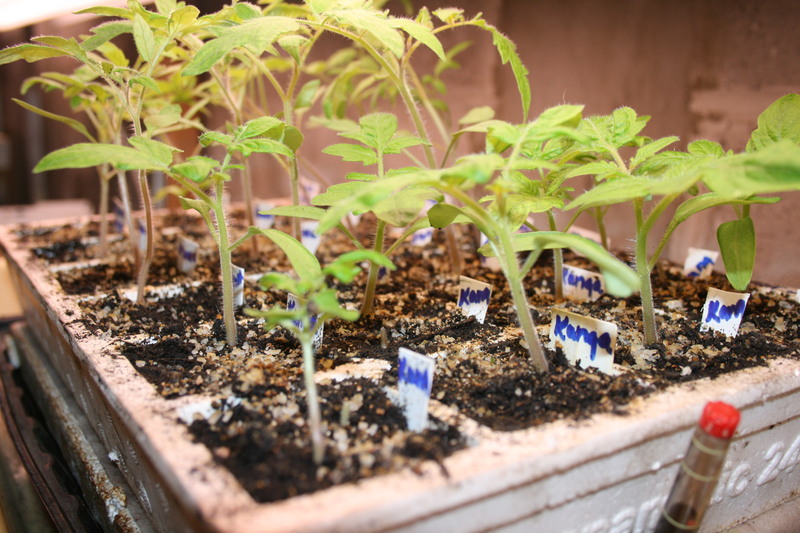 Heat and moisture help speed up the process of sprouting for tomato seeds. 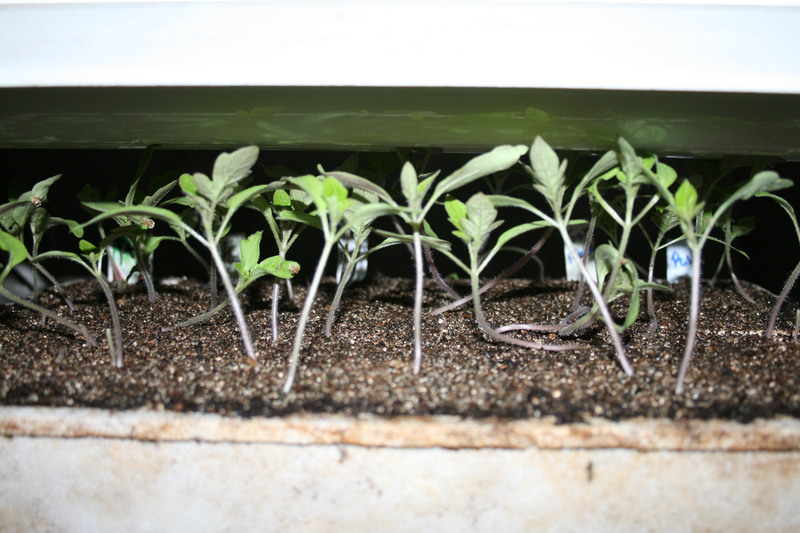 The one disadvantage is that indeterminate tomato seedlings outgrow the cells very rapidly. At the age of 3 weeks and 3 days, these babies are ready for new digs. I start all my seeds in an organic soil specifically created for seed starting. It gives them an edge at the beginning of their lives and makes my life a bit easier too. But when it comes time to transplant, I add a little something something to make the soil lighter – coir. Coir is coconut husk and it really adds value to the growing process. It improves soil structure by aerating it which is good for baby roots. And coir manages water – regulating water by holding it or dissipating it as needed. 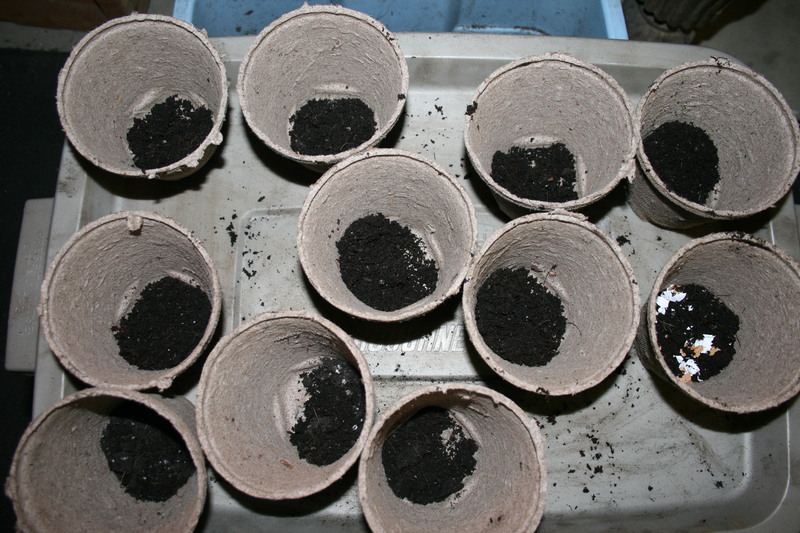 I start by putting a spoon of my soil mix in the bottom of each 3 inch peat pot. I also sprinkle just a bit of chopped egg shell on top of that for slow release feeding of the baby plants. As I take each tomato seedling up out of its cell, I strip off the bottom two leaves and lay the plant at the bottom of the peat pot. 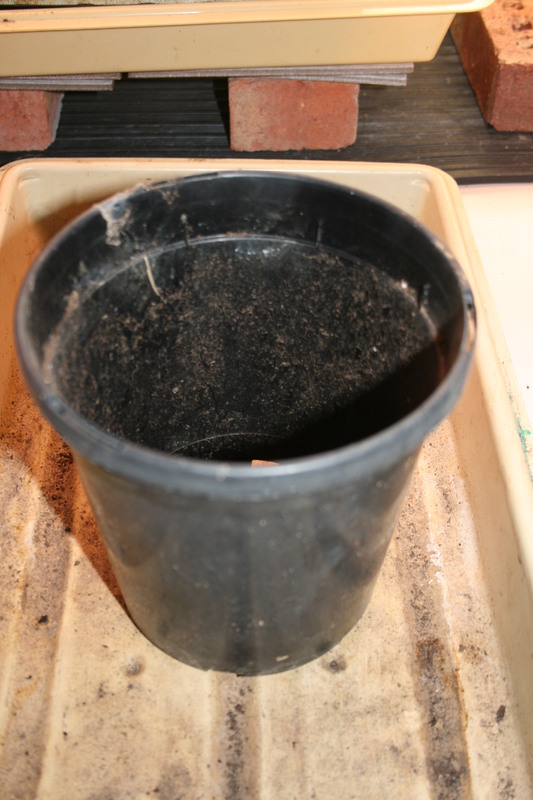 Then, I slowly pack soil around its stem until I fill the peat pot to the top. Sinking the seedling to the bottom of the pot lets the stem put out more roots and ground the tomato plant into the pot. 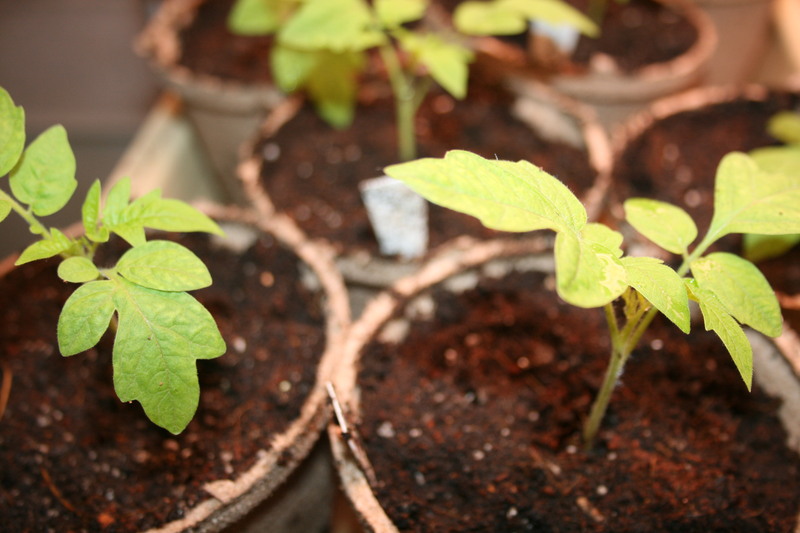 Once in pots, I water in each baby tomato to ensure there are no air pockets around the tiny roots of each plant. Then I move them onto trays and over to my plant stand. 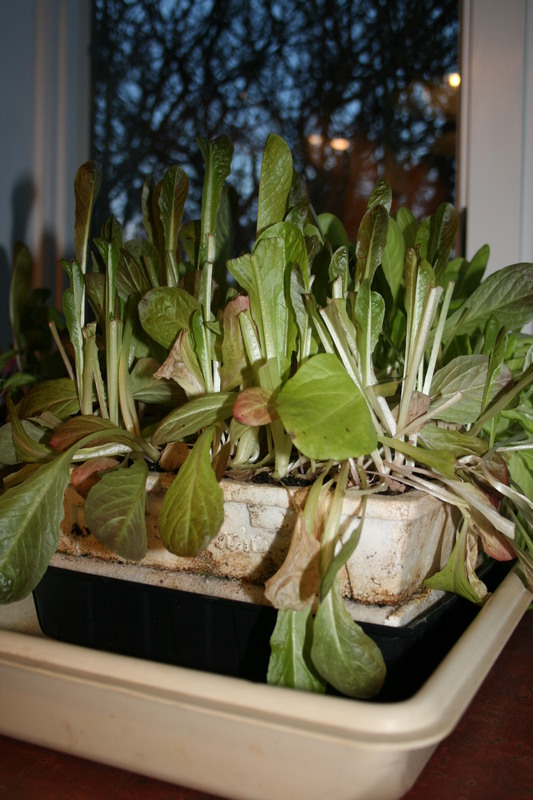 They will look a bit battered for a day or two but recover quickly and start to grow into their new homes. About a week after transplant, I will give them a feeding of very dilute fish emulsion and water. By the 3rd week of April, I will be transplanting all of them, again. 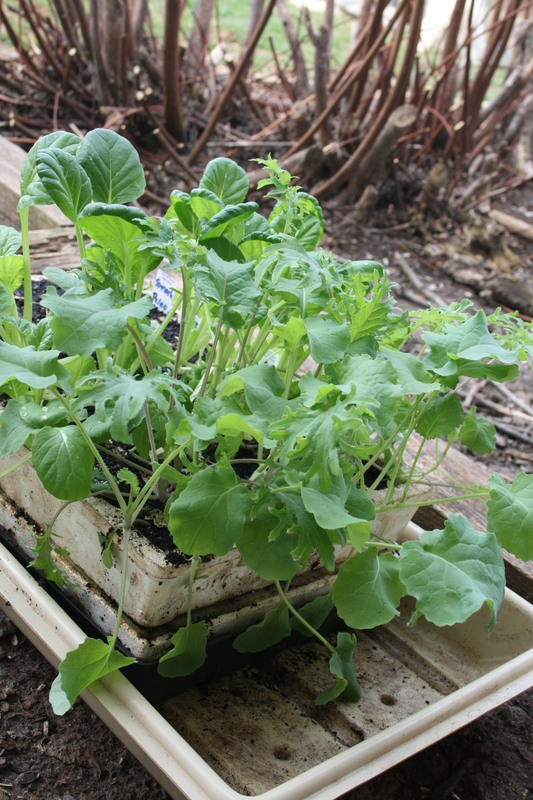 This time, they go into 5 inch wide, 6 inch deep plastic pots (reusable) following the same process – small amount of soil and egg shells, strip off leaves, pack into the new container, water in, rest and a bit of fish emulsion in a week. Currently I have 44 tomato plants humming along in my basement – that’s about 20 more than I have ever planted but, every year, I give the extra away. My sister-in-law, my niece and 2 gardening friends get 4 or 5 hand-raised, heirloom, organic, non GMO tomato plants to play with. I love the process of growing tomatoes and I think I love sharing them almost as much! FYI, I’m also hardening off the tatsoi, kale and lettuce I started in my basement in February. Kale, spinach and tatsoi transitioning to the garden. It will go in the ground just as April begins. Here’s hoping that the worst of the winter weather is behind us! Spring? Where Did You Go?? I know I always start my seeds too early. But never before have I actually had to eat the lettuce I was growing in my 40 cell seed starter. It feels very cannabalistic. But I had to. The lettuce was 6 inches high and growing fast! I confess, it was quite tasty. And I confess to adding liquid fertilizer to the grow tray after the slaughter. Why not? Hydroponic gardeners do that, right? But the remains are sitting on the desk, in front of the big window, watching me. It’s really, really weird. Now it’s all hacked off. And it’s all my fault. 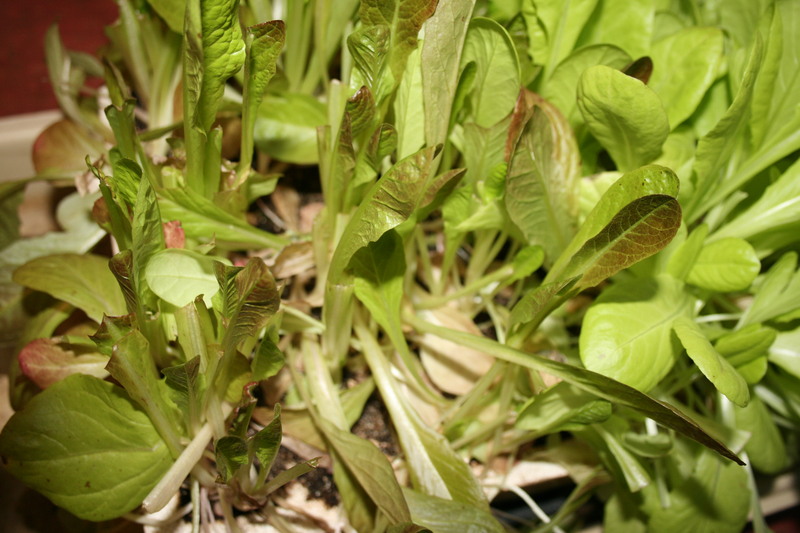 This year, like every year, I started lettuce and beets in the basement in early February. The plan was to put the healthy transplants in the ground in early March. The plan was thwarted by 6 inches of snow, followed closely by 2 inches of pure ice and topped off with another 4 inches of snow. It fell almost 2 weeks ago but still, it lingers. Tomatoes ready for bigger pots. I usually gauge transplant time pretty well. I guess weather forecasters aren’t the only ones being thrown off by the moving jet stream and the heating planet. 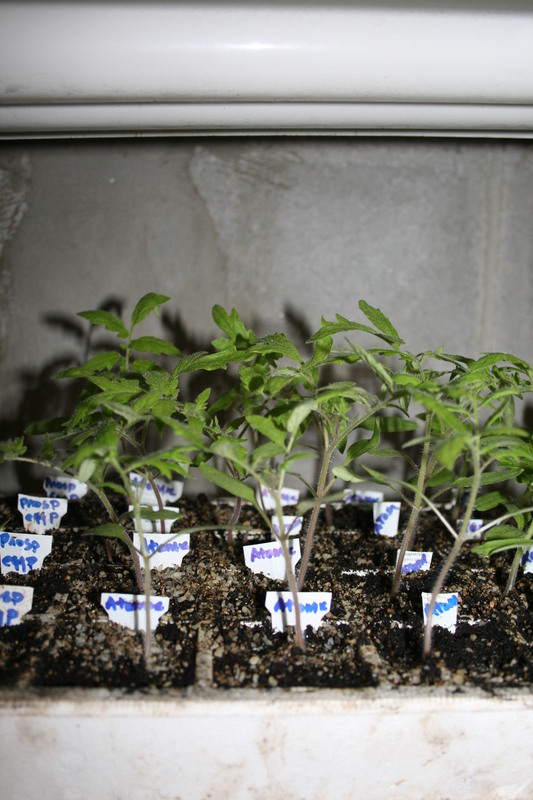 Nonetheless, tomato babies and seedling peppers are up in the basement nursery, too. Here’s hoping I get the start of Summer a bit better than I did Spring! Happy gardening everyone!